RCMP and the Royal Canadian Mint were playing down a report on a Toronto TV station that had some consumers thinking they'd found a glut of counterfeit toonies in their change. RCMP and the Royal Canadian Mint on Wednesday were playing down a report on a Toronto TV station that had some wondering if a rash of counterfeit toonies was circulating in the city. The station reported Tuesday that it had obtained a couple of counterfeit two-dollar coins following a tip from a downtown Toronto merchant who said he "gets them by the truckload." The station then showed what it said was a fake toonie side-by-side with a real one, noting that the Queen's head was larger on the fake. The problem with that, according to the mint, is that millions of legitimate toonies have the "large head" design. So merely having such a toonie is not enough to identify a fake. 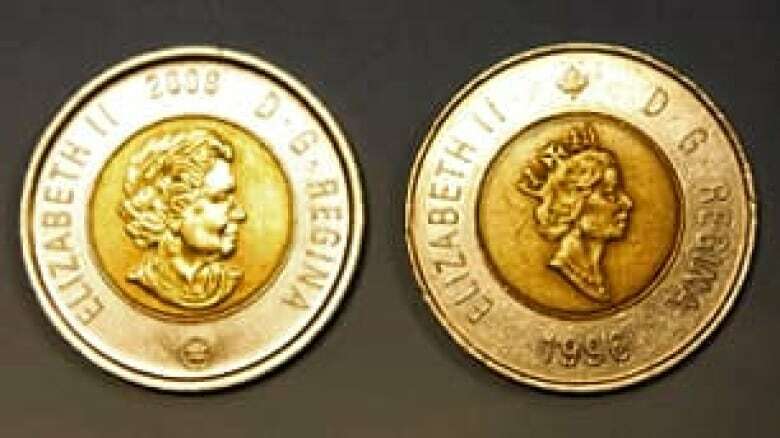 "Since 2003, all toonies have been struck with a new effigy of the Queen," said mint spokesman Alex Reeves — an effigy that is larger than the one that appeared on toonies made from 1996 to 2002. A spokesman for the RCMP said a survey of police forces in the Toronto area found no recent seizures of counterfeit toonies have taken place. Sgt. Marc LaPorte told CBC News the force "is not aware" of any significant attempt to counterfeit the two-dollar coin. Since 2003, the mint has produced more than 148 million toonies. The Mounties say they've seized only 4,230 fakes in the last four years. The first-ever incident of known toonie counterfeiting took place in 2006, when the RCMP and Quebec police broke up a counterfeiting ring near Montreal that was manufacturing high-quality loonies and toonies. Reeves said the mint encounters fake Canadian coins "very rarely." Attempts to counterfeit Canadian currency traditionally focus on banknotes, where the payoff for the counterfeiter is much greater. Preliminary figures for 2009 show that about 70,000 counterfeit bills were passed or seized in Canada last year. The most common counterfeit was the $100 bill (27,061), followed closely by the $20 note (25,776). The RCMP says more fake bills were seized in British Columbia last year than in any other province (21,259). An RCMP raid on a Surrey, B.C., home in May 2009 turned up $130,000 in fake Canadian bills. In the last few years, the Bank of Canada has brought in a series of new security features for all Canadian banknotes — like holographic stripes, raised ink and watermarks — that have made it more difficult to pass fake bills. RCMP stats show the number of fake banknotes passed or seized has generally declined since 2004, when 650,000 phony notes were found. More than a billion banknotes are in circulation in Canada.